Have you ever watched the news and seen someone caught in a dangerous looking flash flood? Have you ever wondered what you would do in the same situation? First, it could happen to you some day. Flash floods are relatively common depending where you live. What should you if you get caught in one? We spoke with the sales manager at Ken Garff West Valley Used, a UT-based used automobile dealer and he was kind enough to review you should do if you get caught in a flash flood. The first thing you should consider when you encounter any water crossing the road is to immediately turn around! Looks can be deceiving so it might look like a little bit of water ahead that’d be easy to plow through. The problems is that it often isn’t – that’s the problem. The water could be deeper than you think and there could be a deep pot hole that you vehicle will get stuck in. This happens to dozens of people every year and it has cost many people their lives. Play it smart and turn around. If fast-moving water has already surrounded your vehicle, and your car is either stalled out or has dropped into a pit, then you need to get yourself out of there as quickly as you can. You don’t want to wait a long period of time for help to arrive because the water could rise and then you have a really dangerous situation. You’ve seen the clips on TV. The unfortunate people that are waiting for help and their car gets swept away by the rushing waters. If you happen to be unfortunate that this happens, you are immediately in a life threatening situation. What you should do is dependent on the exact situation. If your car is floating downstream rapidly, it might be best to leave the vehicle and swim to safety. If you have to exit a vehicle is rushing waters, here’s something you should know – your doors will probably not open. Although it sounds counterintuitive, you’ll want to roll down your windows and try and climb out. If your vehicle actually becomes submerged, you will NOT be able to open your doors. The pressure will be too great. 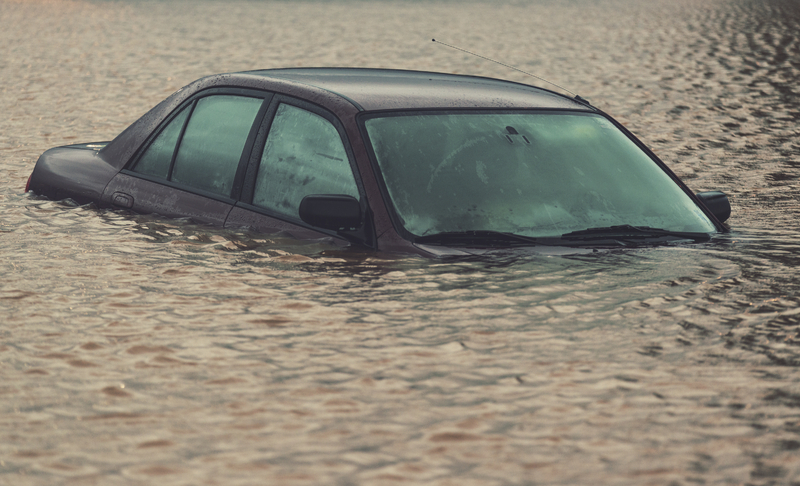 Here’s what you do to get out: believe it or not, allow water to enter your vehicle. Roll down the windows, allow water to enter your car and then just as it fills up, open your doors and escape. If you ever find yourself up against a flash flood, keep a level head and remember: a vehicle can be replaced, but lives cannot. As we mentioned in the first paragraph, turn around!